Why carpet? Plymouth residents know what carpet flooring can do. Whether they want to have a plush fiber for their master bedroom, or durable and stain-resistant StainMaster for a child's room, they know that carpet is a material on which a family can build memories in Plymouth. Carpet flooring in this area need only be procured from one source: the experts at Peck's Flooring America. Carpets are beautiful, both when they are first installed, and many years later if they are properly maintained in homes in Plymouth. Carpets immediately make rooms more comfortable and livable -- everywhere from the guest bedroom that needs sprucing up, to the den where Dad watches his Patriots and Red Sox games. In Plymouth, carpets are part of virtually every home -- and with good reason, as anyone with kids can attest. Many of our carpets are wonderful gathering places for family rituals, such as TV watching and board games. They are so comfortable and plush that you may find that many visitors to your home won't even use the furniture. We have virtually every color and style of carpet that is commercially available, everything from traditional favorites like Berber carpet to today's trendsetters, like unforgettable Tigressa. Whatever your style preferences, count on the pros at Peck's Flooring America -- the Plymouth carpet kings! What happens when you find the carpet in Plymouth that you want? Will you have to install it yourself? Not when you visit the experts in carpet in Plymouth at Peck's Flooring America! 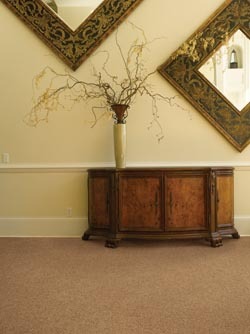 Our professional installers put the carpet in for you, to your specifications. And it's not their first carpet install; Plymouth knows that Peck's Flooring America is to carpet flooring what Bill Belichick is to coaches -- the gold standard. Want to know more? Fill out the form to the side, or give us a call now at <PHONE> to learn more about our discount carpet! Plymouth area residents are also welcome to stop in and see us anytime! We proudly serve the communities of Plymouth, Kingston, Norwell, Halifax, Duxbury, Carver, Sandwich, Pembroke, Marshfield, Massachusetts, and surrounding areas.